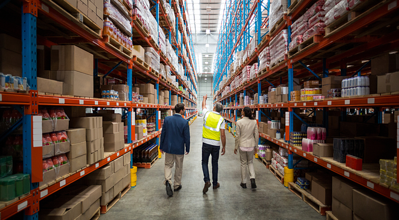 As the Distribution Center Manager of Kane Is Able’s Hagerstown, Maryland operation, I’ve found that the following enhancements were key to boosting productivity in my facility. Importantly, all of these are relatively painless to implement as long as you have buy-in from your team. Use your WMS to reduce associate steps. A few years ago, we added 34 doors to our facility. It felt like we won the lottery. We quickly realized, however, that we lost some efficiency because we got away from the blocking and tackling associated with our previously smaller footprint. So, we retooled the operation to maximize the efficiency of the doors we were shipping and receiving out of most. We used our warehouse management system (WMS) to look at the volumes associated with each door (i.e., each customer), and rearranged our layout to put the operations of the highest-performing customers closer to receiving areas. This reduced the travel time to and from the receiving areas and brought our efficiency back up to par. Optimize use of your YMS. As with WMS systems, yard management systems (YMS) can be costly. But, but when used optimally, a YMS more than offsets those costs through the efficiencies it brings to your operation. So, make sure you’re using it wisely. For example, our yard was previously a mishmash of separated lots and locations. We had yard jockeys traveling too far and eating up valuable time looking for trailers. We used our YMS to divide our campus into zones and onboarded our carriers to unload in a specific zone. Our YMS now directs our yard jockeys to the closest trailer location – thereby eliminating the wild goose chases and improving the overall flow of the yard. Declutter your warehouse. Just like your house, decluttering and maximizing the space of your warehouse is sometimes easier said than done. We were finding that we simply didn’t have enough space in areas where we receive labor-intensive loads. So, our team put our heads together to find ways to declutter these areas. It worked. The areas in which associates fill and breakdown loads and make pallets are now free from traffic. This results in not only a more efficient space, but a safer one as well. Prioritize safety. As with our decluttering efforts, our team identified ways to make for a safer warehouse. With 18 forklifts running at any given time, we put a lot of effort in to finding and removing blind corners from the facility. We adjusted operations to keep traffic to the perimeter as much as possible. This largely eliminated blind corner hazards within the warehouse and freed up additional space. Maintain equipment. This may seem obvious, but proper equipment maintenance is vital to warehouse productivity. We’re fortunate to live in a time where we have so many technologically-advanced tools to perform our work. But, we also realize just how reliant we are on those tools. If a single forklift or retractable scan gun is out of service, it can threaten your ability to get orders out on time. Because of this, we train our associates in the maintenance and care of all our equipment and perform routine checks to make sure equipment is operationally sound. Don’t rush training. A tentative associate is a potentially unsafe and inefficient associate. We therefore don’t allow trainees to work on their own until we see that they have the necessary confidence in their abilities – and the confidence of our management team. Before, during, and after that point, each associate is assigned to a more experienced mentor who acts as a direct go-to for instruction and guidance. Anticipate staffing requirements. No one likes surprises. If your operation utilizes temporary associates, this applies to them as well. We try to stay ahead of our warehouse labor needs in order to bring in staff before the need for them becomes urgent, and to perform cuts as far in advance as possible. By treating temporary associates with the same courtesy and respect afforded to full-time staff, we find that they are more likely to return the next time a need is identified. Another piece of advice that underlies all of the points mentioned is to listen to the associates who do the work. These are the people who understand where the bottlenecks are and are in the best position to suggest productivity-enhancing changes. Just recently, a team of our associates brainstormed ways to improve the efficiency of our palletizing operation. We listened, and now process around 115 cases an hour instead of 90. It helps that KANE associates are trained on Lean methodologies. To learn more about the ways in which KANE can maximize warehouse productivity within your supply chain, contact us today.